Unless urgent action is taken to feed people in north-east Nigeria, Somalia, South Sudan and Yemen, more than 20 million people will not find enough food to eat, the heads of the United Nations food agencies today warned. “Many people have already died,” UN Food and Agricultural Organization (FAO) Director-General José Graziano da Silva said on the sidelines of FAO's Council – the executive arm of FAO's governing body – which is now meeting in Rome. He stressed that peace is essential for ending the fighting which is spurring the famine, but more needs to be done to fight hunger. “I visited Maiduguri in north-eastern Nigeria and saw myself how powerful agricultural support can be in a humanitarian crisis,” Mr. Grazaiano da Silva said. A famine has been formally declared in parts of South Sudan, while north-eastern Nigeria, Somalia and Yemen are on the brink of famine, according to the press release. “We have the strength, logistical capacity and technology to get the job done. What we need is access to the people who are on the brink of famine and resources, now not later,” said David Beasley, the new Executive Director of the UN World Food Programme. For example, in South Sudan, FAO and WFP are part of an inter-agency rapid response bringing life-saving food, fishing and vegetable-growing kits, and other emergency services to hard-to-reach communities gripped by famine. However, more funding is needed. Food production kits cost less than $90 but can provide enough food for a family of eight for six months, FAO has said. Around $4.4 billion has been requested for programs related to the famine. So far, $1.2 billion or about 27 per cent, has been received, according to the UN Office for the Coordination of Humanitarian Affairs (OCHA). “Without this support, we will have to make life-challenging decisions over who will receive food and who will not,” cautioned Mr. Beasley. 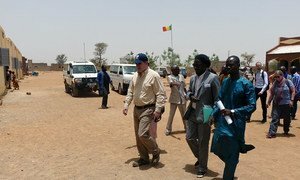 Concluding a three-day mission to Mali, a senior United Nations relief official has underlined the need to keep the humanitarian needs of its people in the international spotlight.